I primarily search in South Eastern Massachusetts,but could also be able to search other areas of the state or at least know someone that probably could. I work on a Gift Basis...This means that you pay me what you feel it was worth, and what you can afford, to have me come out and find your lost item. There will be a $25 fee for my gas expense if the item is not found. If you are further then 30 miles please contact me and we can discuss the gas expense. I search: fields, lawns, beaches, snow piles ,and in water up to neck deep. 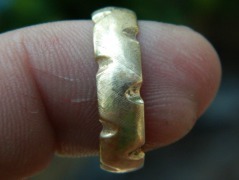 I'm 45 yrs old and have lived in Massachusetts all my life.I have found and returned many ,Bands, Wedding sets ,ect.. I have been land detecting for about 12 years and water detecting for about 6 years. Hi, Kent! Hope you’re doing well. I’m sorry I haven’t sent the story yet. I tried to post it on the website, but couldn’t figure out how to do so. I lost my engagement ring while raking at my mother’s house. I felt it come off into the bag of leaves I was using, but then couldn’t find it after multiple rounds of sifting through the leaves despite knowing where it had fallen. 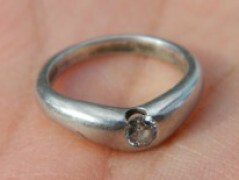 My husband found Ring Finders – and Kent – through a quick google search. When Kent came to my mother’s house to retrieve the ring, one of the first things he said was: “It’s almost never where people think it is.” Indeed. Delight! Relief! Joy! I hugged Kent. And then my mother. And then my husband when I got home. Thank you, Kent and Ring Finders!